School libraries are not what they used to be: meeting points for pupils doing quiet reading or checking facts and researching projects. More work is done from duplicated worksheets, from the internet, with the computer, and it is more class room based. The central school library which can serve 600 pupils is redundant. That is the assessment of the head of Ponteland Middle School, Dr Caroline Pryer, who with her staff, have decided on the concept of classroom libraries with more choice about the books given to the pupils. But how to fund this, especially with increasingly restricted budgets? Ponteland Lions were asked to help. The Lions already ha ve good links with the school and listened sympathetically but what was the pay back for them? 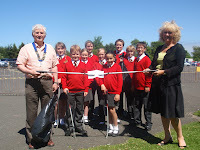 The school site, shared with the High School, is one of the worst places for litter in Ponteland and there is obviously huge scope for voluntary litter picking. What if the children were asked to do litter picks and then funds were made available for buying books? The project was agreed by all interested parties, it has started this month, and will continue until November when the Lions should have funded books to a total of £2000.